In his October 2018 Update, Jeff takes a closer look at the current headwinds, challenges facing China and relative valuations. With football season upon us, it is becoming obvious even after just several weeks that some teams seem ready to capture the championship while others will need to rebuild and wait for better times. If you are a fan cheering for one of these rebuilding teams, it can be frustrating to wait for your team to take the necessary steps that will allow them to thrive. It is no different when we make our allocation decisions. While we do not root for one asset class over another, we certainly have studied the longer-term winners and losers. The emerging markets equity asset class seems to be one of those teams that has been a long-term winner, although it occasionally suffers from some difficult years. While our analysis shows that the long-term prospects of this asset class remain robust, primarily because of demographic trends and strong long-term GDP growth projections of these countries, the shorter-term environment continues to be unfavorable. Emerging markets equity has a history of either being the top or bottom performer when compared to other asset classes globally. In fact, over the past 15 calendar years ending 2017, this asset class has either been the best or the worst in 12 of those years. When compared to other major asset classes, such as the S&P 500, the Russell 2000 (small cap) or the MSCI World ex.-U.S., this asset class performs at extremes. Therefore, determining when to overweight or underweight this asset class within a well-diversified portfolio can pay off for investors. The relative underperformance of this asset class is nothing new. After very strong absolute and relative performance in 2017, emerging markets equity has recently struggled from a combination of tighter global liquidity conditions, local political scandals and even some policy errors (such as Turkey waiting too long to raise interest rates). After strong gains in January, the asset class has been challenged, weighed down by the strength in the U.S. dollar and higher U.S. interest rates (see Exhibit 1). U.S. trade policy is another negative component in the equation for emerging markets. President Trump wants structural reforms, which include lowering tariffs to be more in line with other countries and increased protections for U.S. intellectual property. As China represents 30% of the MSCI Emerging Markets index, you can see that difficult times could potentially continue for the foreseeable future. Recent data has confirmed that China's growth is slowing, having peaked at 6.9% year-over-year in 2017 and forecast to grow at 6.6% and 6.2% in 2018 and 2019 respectively, according to the International Monetary Fund. Some strategists believe China's pace of growth is lower than what is widely reported. There are many factors contributing to this slowdown, including stricter financial regulation, a tightening of financial conditions due to the Fed raising rates, and a decline in consumer spending as evidenced by the lowest level of retail sales in 15 years. Real estate and infrastructure investments have also declined as a result of the deleveraging efforts of the Chinese government. The challenges facing China are detailed further in China's Balancing Act, written by BNY Mellon's head of Global Investment Strategy, Alicia Levine. Now trade uncertainty is in focus, with many concerned that an escalation of tensions could lead to a currency war and further capital flight out of China. It isn't helping China's case that they rely on U.S. consumers for some $500 billion of exports per year. While a 10% tariff on $200 billion in goods, put into effect on September 24, 2018, only amounts to a small percentage of China's GDP, additional tariffs could weigh on growth or prompt China to take retaliatory actions. We have already seen China take some steps to stimulate growth and offset the negative impacts of tariffs by implementing recent tax cuts to those at the lowest income levels, lowering reserve requirements and imposing cost controls within many Chinese companies. As trade tensions escalate and negotiations potentially extend into next year, China will need to try to balance its stimulative efforts while maintaining business and consumer confidence so as not to exacerbate any slowdown of growth. This may be why President Xi is trying to distance himself from the trade talks so as to not be associated with the negative effects. Is Trump's belief that trade wars are easy to win proving to have some merit? Time will tell. With all the near-term obstacles for emerging markets equity, our longer-term view remains quite favorable. We continue to recommend exposure to this asset class within a well-diversified portfolio, although we are underweight the asset class compared to a client's long-term strategic weighting. Over the past 10 years, emerging markets have delivered solid returns, with an average annual gain of 5.8%. Our long-term outlook also remains positive, with emerging markets equity expected to deliver 8.3% based on our capital market assumptions, which look out seven to 10 years. Our expectations are based on very strong demographic trends and the higher growth potential that exists within many emerging market countries, as well as stronger earnings growth. However, the asset class comes with a higher level of volatility, making the decision of when to overweight and underweight the asset class extremely important. 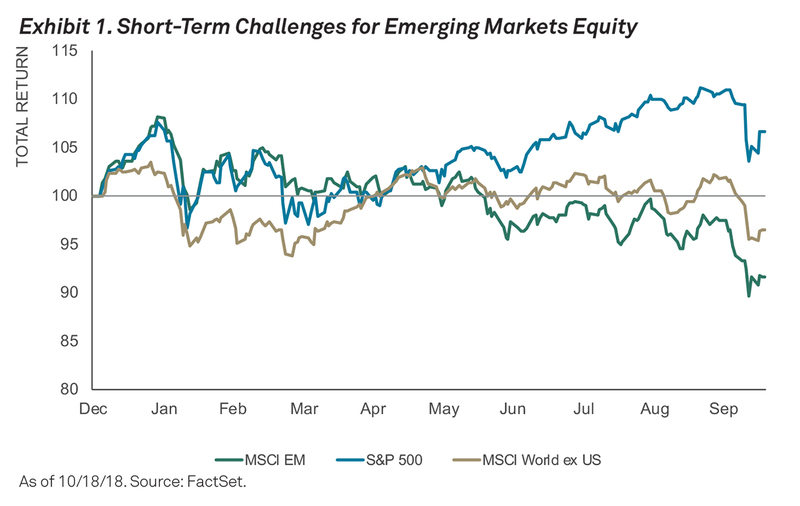 Our market cycle research has shed some light onto how to determine when emerging markets equity could be a strong performer. While the asset class may do well at any point in an economic cycle, our analysis shows that it performs best in an economic recovery's early stages. As such, emerging markets tend to outperform when the world is coming out of a global economic recession. Although past performance is not indicative of future results, history does show us that emerging markets equity has had a perfect record of leading the way out of recession by delivering the strongest absolute and relative performance as compared to other major asset classes. Over the past 15 years, emerging markets equity has led all other major asset classes out of a recession or slowdown. Emerging markets equity was the top performer in 2003, as markets recovered from the 2001-2002 recession, and in 2009, as the world began to recover from the financial crisis. Even 2012 saw emerging markets equity on top, following the recovery from the Eurozone's slowdown during 2011. The Investment Strategy Committee, which I chair, has been recommending an underweight to this asset class for the last four years because we anticipated slower growth in developing countries, U.S. dollar strength and diverging global monetary policy. Even though emerging market valuations have gotten cheaper, currently trading at 10.6 times 12-month forward earnings, we believe that now is not the time to increase exposure. Given the research just highlighted, you can generally expect us to have an overweight to this asset class after a recession has taken hold and we see the end of that slowdown in sight. Until then, expect us to continue to maintain an underweight to the asset class as we wait for the emerging markets equity team to rebuild and wait for an environment where it has historically outperformed. This material is the property of BNY Mellon and the information contained herein is confidential. This material, either in whole or in part, must not be reproduced or disclosed to others or used for purposes other than that for which it has been supplied without the prior written permission of BNY Mellon. This material is provided for illustrative/educational purposes only. This material is not intended to constitute legal, tax, investment or financial advice. Effort has been made to ensure that the material presented herein is accurate at the time of publication. However, this material is not intended to be a full and exhaustive explanation of the law in any area or of all of the tax, investment or financial options available. The information discussed herein may not be applicable to or appropriate for every investor and should be used only after consultation with professionals who have reviewed your specific situation. The Bank of New York Mellon, Hong Kong branch is an authorized institution within the meaning of the Banking Ordinance (Cap.155 of the Laws of Hong Kong) and a registered institution (CE No. AIG365) under the Securities and Futures Ordinance (Cap.571 of the Laws of Hong Kong) carrying on Type 1 (dealing in securities), Type 4 (advising on securities) and Type 9 (asset management) regulated activities. The Bank of New York Mellon, DIFC Branch (the “Authorised Firm") is communicating these materials on behalf of The Bank of New York Mellon. The Bank of New York Mellon is a wholly owned subsidiary of The Bank of New York Mellon Corporation. This material is intended for Professional Clients only and no other person should act upon it. The Authorised Firm is regulated by the Dubai Financial Services Authority and is located at Dubai International Financial Centre, The Exchange Building 5 North, Level 6, Room 601, P.O. Box 506723, Dubai, UAE. The Bank of New York Mellon is supervised and regulated by the New York State Department of Financial Services and the Federal Reserve and authorised by the Prudential Regulation Authority. The Bank of New York Mellon London Branch is subject to regulation by the Financial Conduct Authority and limited regulation by the Prudential Regulation Authority. Details about the extent of our regulation by the Prudential Regulation Authority are available from us on request. The Bank of New York Mellon is incorporated with limited liability in the State of New York, USA. Head Office: 240 Greenwich Street New York, NY 10286, USA. In the U.K. a number of the services associated with BNY Mellon Wealth Management's Family Office Services– International are provided through The Bank of New York Mellon, London Branch, 160 Queen Victoria Street, London, EC4V 4LA. The London Branch is registered in England and Wales with FC No. 005522 and #BR000818. Investment management services are offered through BNY Mellon Investment Management EMEA Limited, BNY Mellon Centre, 160 Queen Victoria Street, London EC4V 4LA, which is registered in England No. 1118580 and is authorised and regulated by the Financial Conduct Authority. Offshore trust and administration services are through BNY Mellon Trust Company (Cayman) Ltd. This document is issued in the U.K. by The Bank of New York Mellon. In the United States the information provided within this document is for use by professional investors. This material is a financial promotion in the UK and EMEA. This material, and the statements contained herein, are not an offer or solicitation to buy or sell any products (including financial products) or services or to participate in any particular strategy mentioned and should not be construed as such. BNY Mellon Fund Services (Ireland) Limited is regulated by the Central Bank of Ireland BNY Mellon Investment Servicing (International) Limited is regulated by the Central Bank of Ireland. BNY Mellon Wealth Management, Advisory Services, Inc. is registered as a portfolio manager and exempt market dealer in each province of Canada, and is registered as an investment fund manager in Ontario, Quebec, and Newfoundland & Labrador. Its principal regulator is the Ontario Securities Commission and is subject to Canadian and provincial laws. BNY Mellon, National Association is not licensed to conduct investment business by the Bermuda Monetary Authority (the “BMA") and the BMA does not accept responsibility for the accuracy or correctness of any of the statements made or advice expressed herein. BNY Mellon is not licensed to conduct investment business by the Bermuda Monetary Authority (the “BMA") and the BMA does not accept any responsibility for the accuracy or correctness of any of the statements made or advice expressed herein. Trademarks and logos belong to their respective owners. BNY Mellon Wealth Management conducts business through various operating subsidiaries of The Bank of New York Mellon Corporation. ©2018 The Bank of New York Mellon Corporation. All rights reserved.